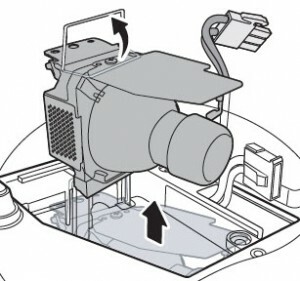 Follow our quick guide for hassle free installation of a new BenQ 5J.J0A05.001 projector lamp. 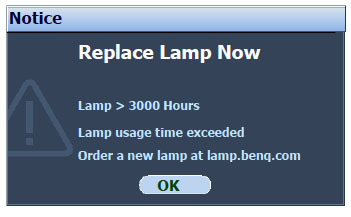 You can expect up to 3000 hours from the BenQ 5J.J0A05.001 projector lamp before it needs to be replaced in the BenQ MP525/MP525P projector. 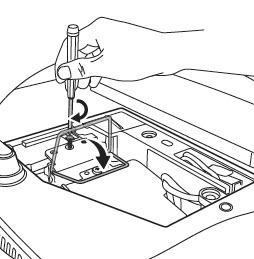 In order to keep your BenQ MP525/MP525P projector working properly, you must install a genuine BenQ 5J.J0A05.001. 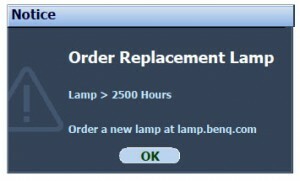 Avoid generic knock-offs or lamps advertised as “compatible.” Although they appear to be a great bargain, generic lamps actually have a shorter life span and give off poor illumination. These lamps are prone to explosion and have been created using toxic substances such as Krypton-85. Using a counterfeit generic lamp will void any warranty for your BenQ MP525/MP525P projector. Buying from an authorized seller of genuine projector lamps ensures installation of a lamp created with the proper components and workmanship that works properly with the key components in your projector. Genuine lamps will give you the sharpest and brightest picture. Learn how to spot a counterfeit lamp. Reduce the risk of electrical shock by disconnecting the power cord on the MP525/MP525P projector. 1. Protect the BenQ MP525/MP525P projector’s top surface by placing it face down on a soft surface. 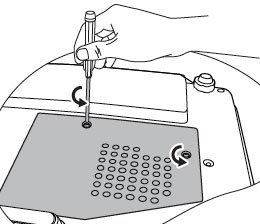 Turn the projector over and loosen the screws on the lamp cover. 4. 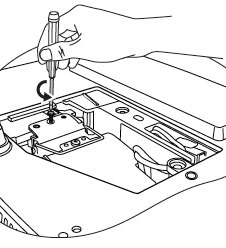 Pull out the lamp connector from a slot in the lamp compartment. Disconnect it from the BenQ MP525/MP525P projector. 5. 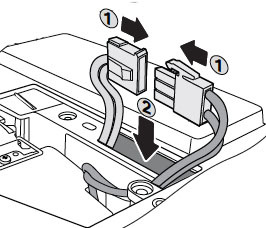 Using the wire handle, slowly pull the BenQ 5J.J0A05.001 lamp out of the projector. 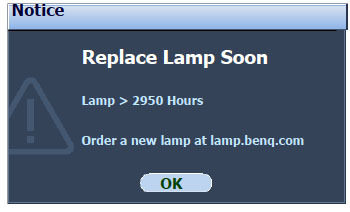 Never force the lamp out; pulling too quickly can cause the bulb to shatter. Learn what to do should the bulb shatter. 6. 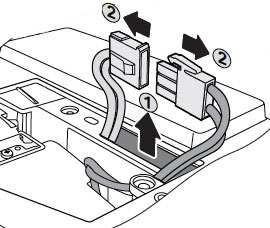 Reconnect the lamp connector. 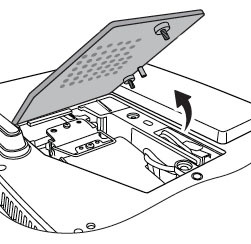 Put the BenQ 5J.J0A05.001 lamp back into its slot so that it is flush with the BenQ MP525/MP525P projector. 8. 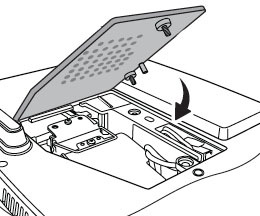 Replace the lamp cover on the BenQ MP525/MP525P projector. It’s important to set the lamp timer so the BenQ MP525/MP525P can accurately track the life of the newly installed BenQ 5J.J0A05.001 lamp. 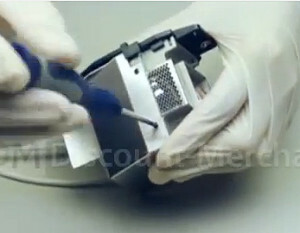 Keep your air filters clean to avoid overheating the BenQ MP525/MP525P projector. 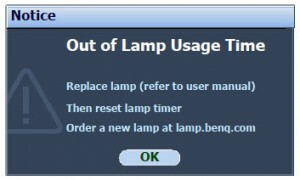 Hi, I’ve just bought a new genuine lamp for my Benq MP525P and installed it but the projector turns on for about a minute but then completely shuts down and will not turn on for at least 5 minutes. It’s not getting hot either. Can you help please?